﻿ Casa Padma Suites Legian, Bali | FROM $28 - SAVE ON AGODA! "Staff were friendly and very accommodating." 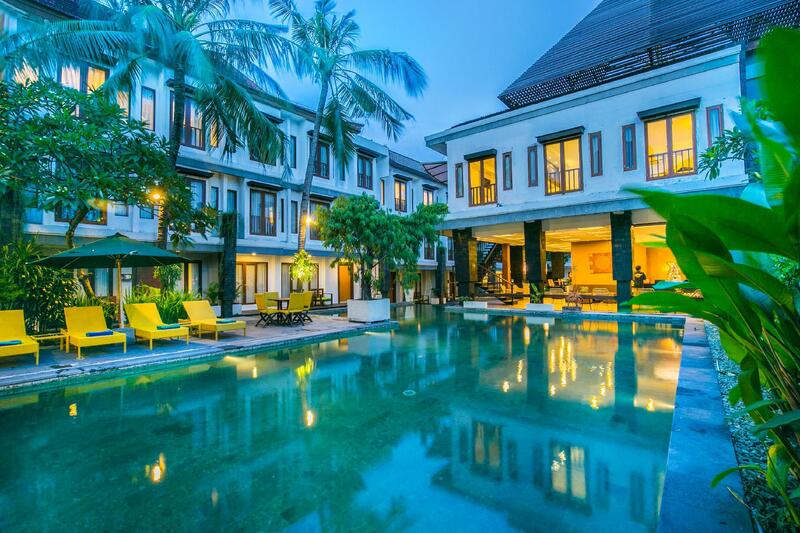 Have a question for Casa Padma Suites Legian? "Great small hotel, staff are great." "This hotel is great for the party people." "Room is huge and is of value for money for the price we paid..."
Guests arriving at the stylish 3-star Casa Padma Suites Legian will immediately notice the U-shaped swimming pool with its swim-up bar which surrounds the hotel’s restaurant and lobby. 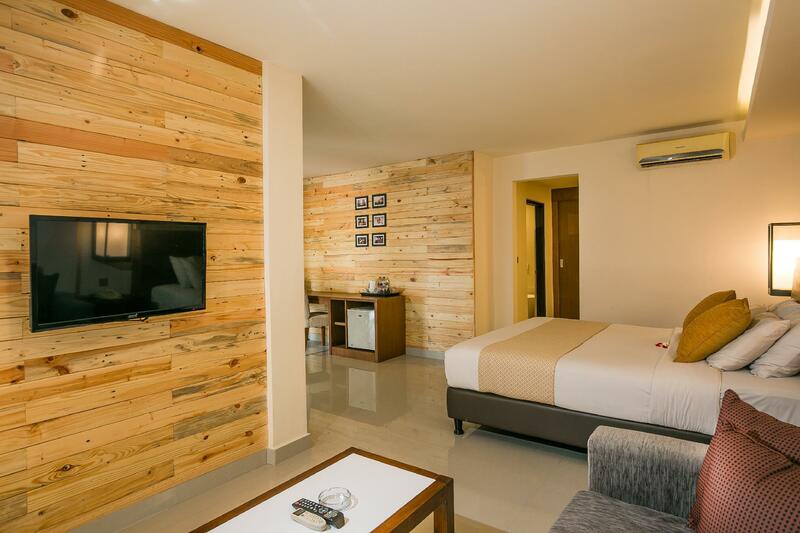 Close to Legian and Kuta Beach, this small and friendly facility is centrally located a short drive from the nightlife of Kuta, Legian, and Seminyak. Rooms are designed in burgundy red and cream and have an avant-garde, contemporary feel. Relax in any of the several restaurants, including the well-known Wine and Cigar Lounge. To make your reservation at Casa Padma Suites Legian, please proceed to our secure online booking form. "Fantastic location, wonderful staff, large family rooms that..."
Have stayed at Casa Padma many times and over the last couple of years they have renovated their rooms. The rooms are very large with a lounge area in all (or most) of them. Breakfast is not a buffet but there are several choices and hence it is always cooked fresh. Nothing is too difficult for any of the staff from reception to maintenance staff they are always helpful and smiling. 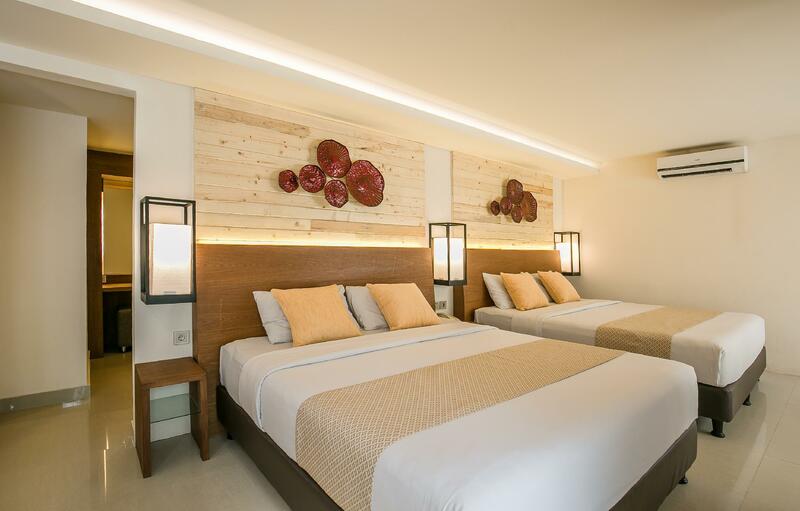 The Hotel is on Jalan Padma and is convenient to the beach, Jalan Sahadewa (Garlic Lane) and Jalan Melasti and there are numerous bars and restaurants to choose from. The only drawback is a new place called Summer Queen with a live band (across the road) and the karaoke bar at Legian Pub (across the road) is on every night and finishes at midnight. If you are going to bed before midnight don't forget your ear plugs. Truly loved this hotel. Location was brilliant. Staff were super friendly. The pool was wonderful after a hot day. The only thing I probably didn't like was the breakfast..... so next time I stay I'll get it without breakfast. No big deal. I'd definitely recommend to family and friends. Great location and staff, the deluxe Family suite was large with good areas if traveling with infants or small children (need to watch out as we were on the first floor and our 2-year-olds lent on the window in the corridor and it flung open as it wasn't locked properly) As per other reviews the Karaoke across the road is loud but didn't really worry us. Nice quiet pool area that gets good sun. A good 3 * hotel. The hotel was located in the busy street with a lot happening. That being said, there is a pub that opens till 12am that play very loud karaoke music. If you sleep early or is easily affected then this is not for you. Overall, i enjoyed the experience, the staff was kind and helpful, they allowed me to check out 2hours late as i didn't want to roam the streets with luggage on my last day. Great location, great pool- which really was more private than I thought it would be from the pictures. Although we had a pool access room, it wasnt a renovated one. I could list the small issues that come with an older room but not worth it, we had nothing to complain to staff about so not going to here. Will definitely stay again- but will ask for a renovated room if available. We stay here a lot as a young family. It's in a great location the staff are wonderful and the rooms are not small. The only downside would be the restaurant. It used to be quiet good food but I think the quality of food has gone down. Initially got an unrenovated room, wasn't as nice as the photo's I remembered, everything a little tired, old air con, old TV, old furniture etc. However acceptable. But they were renovating some rooms next to us, so we asked to be moved. They moved us up a floor (so we missed out on pool access), but the rooms were VERY nicely renovated. I had no problem swapping. Food and coffee (must try Bali coffee) is good at the restaurant. Room is huge and is of value for money for the price we paid. However, cleanliness has to improve further. Will be back again if the value maintains. We stayed here for 17 nights, 12th October to 29th October and it was out third time at this hotel. You cannot knock the staff, especially Pada and G'dey who always remember us with a smiling face. We love this part of Legian, so this Hotel is a perfect location for us, the rooms are very large, but the Hotel needs some tender loving care to bring us back again. Great location and pool is great, the room we stayed in was a little under the weather though, definitely needs repair/renovation however by the look of some of the other rooms they aren't all like this Overall would definitely recommend as staff were awesome & definitely good value for money! Would stay there again! It's was very good and happy stay the hotel has its own restaurant it was good. Opposite the hotel has a legian bar. Which has live band on the weekends. It was also good. Just that the beers are abit expensive everywhere accept at the mini mart. Beware of 21% Vat and 10% service which is crazy on the most of the restaurants and bars. Kids loved the pool but for me was lacking atmosphere and pool bar was always unattended. In 12 days only could order one drink. Great hotel just please keep it maintained it's appearance is starting to slip. We have stayed at this Hotel twice now, and both times at the end of November into mid December. Although schoolies is happening at this time, this year there were no schoolies allowed at the hotel (they weren't a big problem last time). It was quiet and the other guests were great. Overall the Hotel is getting a bit old, but I woud stay here again, it is good value for money and in an excellent location with lots of restaurants, bars nearby. Stayed in the deluxe suite for 2nights. Large rooms with 2 comfortable double beds. For such a large room, a small pantry with wash basin would be better. The lights are a little too dim, especially the stairways, which could be dangerous at night to walk for young children. Only have 1 door key, when the room is meant for 4 person! About 10mins walk to the beach. We have confirmed 2 vans airport transfer from airport to hotel, unfortunately, only one van was sent. 5 glasses of welcome drinks were offered to 7 pax and seemed that these were half consummed by other guests or staff? Shower area was clogged and was not fixed . We’re staying for 3 night, breakfast was good but you need 20-30 minute to wait the food read to served ! Infront of hotel there’s a restaurant with a loud speaker of karaoke till mid night and you can perfectly hear the sounds and the rest of facilities are worth with the price.